Storied Reading Terminal Market gets packed for lunch because it offers something for everyone to love. 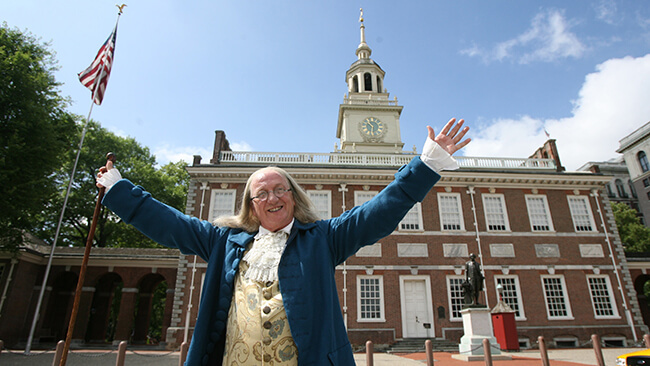 The United States began in Independence Hall, where both the Declaration of Independence and the U.S. Constitution were debated and signed. Philadelphia’s Penn Relays is the oldest and largest amateur track-and-field relay. The Italian Market is America’s oldest outdoor market. One of the nation’s oldest and finest working farmers markets, Reading Terminal Market, houses more than 80 merchants, including Amish farmers. The Walnut Street Theatre is the oldest continually operating theater in the US and was the first theater to install gas footlights and air conditioning. Jewelers’ Row located on Sansom Street between 7th and 8th streets, is the nation’s first, and second-largest, diamond district. Elfreth’s Alley is the oldest continuously inhabited street in the U.S. The National Constitution Center holds the distinction of being the world’s only institution dedicated to the U.S. Constitution. The first Congress of the United States met in Philadelphia in Congress Hall, adjacent to Independence Hall. The first Jewish congregation in the city, Mikveh Israel was established in 1740 and remains one of the oldest in the nation. Richard Allen and Absalom Jones founded the Free African Society, the nation’s first black self-help organization, in 1787. The nation’s first stock exchange started here in 1790 as the Philadelphia Stock Exchange. Founded in 1791 by Reverend Richard Allen, Mother Bethel A.M.E. Church was the first African Methodist Episcopalian Church. It’s set on the oldest parcel of African-American-owned land in the country. The United States Mint, the country’s first mint, opened in Philadelphia in 1792. The first hot air balloon in the U.S. was launched on January 9, 1793 from Independence Square. In 1805, Charles Willson Peale founded the Pennsylvania Academy of the Fine Arts, making it the nation’s first art school and museum. In 1824, the Franklin Institute Science Museum was established as the first professional organization of mechanical engineers and professional draftsmen in the United States. The Children’s Hospital of Philadelphia (CHOP) opened in 1855 as the nation’s first children’s hospital. The Academy of Natural Sciences of Drexel University displayed the first and most complete dinosaur skeleton ever discovered in 1858 — and it’s still on view today. Approved by the Zoological Society of Philadelphia in March 1859, the Philadelphia Zoo is the nation’s first. ENIAC, the world’s first computer, was developed more than 50 years ago at the University of Pennsylvania. In 1959, Philadelphia became the first city to pass an ordinance mandating that all construction projects designate a certain percentage of the costs for public art.